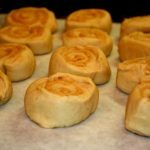 Almond Buns – Delicious Baking Ideas! If you ask people to tell you about almond buns the most common answer is going to be the Swedish type almond bun. These are rich yeast breads done in a hot crossed buns fashion. The dough is loaded with a combination of almonds, almond powder, and almond extract. Then it is shaped into rounds and baked. While still hot from the over the buns are glazed and topped with more almonds. These are about the only kinda of almond buns you are going to find in the south, but the Swedish almond bun is not the only almond bun in the US. Any New Yorker would tell you that an almond bun is something like a cinnamon roll. Unlike the Swedish almond buns the origin of this bun is unknown. No matter where it came from however, it is delightfully. The dough is almost exactly the same as the dough for cinnamon rolls. It is sometimes flavored with a little bit of almond powder or extract. The filling of these types of almond buns vary dramatically. From the basic almond cream to a complex mixture of almonds, fruits, and creams or cheeses. It takes a little more effort than the Swedish buns, but the cinnamon roll style almond bun offers more options. The last style takes the most work but is definitely worth the effort. The filled brioche style almond bun has a warm brioche like dough surrounding a creamy filling. These take a little more time and effort than the other two almond bun types. First you have to refrigerate your dough over night. So these are not the buns you make when you have an almond bun craving. Secondly with these you have to work the dough around a filling such as marzipan. It is easy to overwork your dough or to rip it to shreds. It takes a while to master the brioche almond bun, but the flaky dough and the warm creamy filling make it the most exceptional tasting almond bun.